CSS training is a great way to improve your swim fitness for any race distance over 400m. It focuses on your fitness around your lactate threshold - developing your ability to sustain a strong pace over a long period of time. In Swim Smooth parlance, we call this "Becoming A Diesel Engine". Up until now to work out the speed you should be swimming during a CSS session you need to perform the CSS Test - a training session where you swim a 400m time-trial followed by a 200m time-trial. You put the two times you achieve in the CSS calculator on the Swim Smooth website here or use the more advanced analysis in the Swim Smooth Coaching System here. These calculators spit out your CSS pace per 100m, which you then program into a Finis Tempo Trainer Pro to accurately target during your training sessions. - We recommend you retest every 4 to 6 weeks, however you can make some quite large improvements week by week, meaning your fitness might have moved on without you taking account of it. 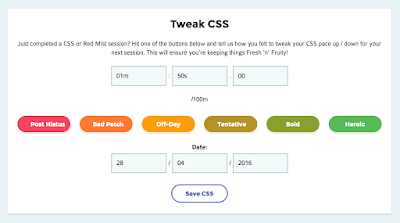 - The calculation to find your CSS pace is very sensitive. If you pace your 400 or 200 wrongly and end up with a slower time than you are actually capable of, then the calculated CSS pace can be wrong (either too fast or too slow). - The CSS test itself takes up a valuable training session and since it's only 600m of fast swimming, it has little benefit as a training session in its own right. That's not ideal but don't worry, there is a solution coming - it's called "CSS Tweaking" and it's the future of training for distance swimming! 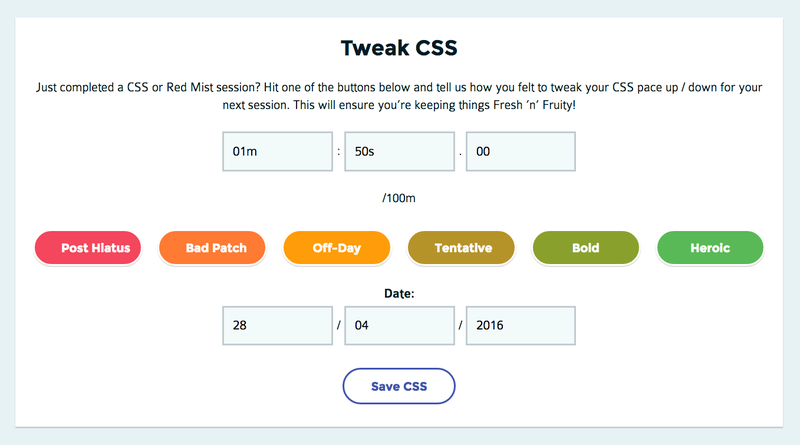 Tweaking is a clever Swim Smooth algorithm that adjusts your CSS pace as the weeks and months go by without you having to perform the CSS Test. 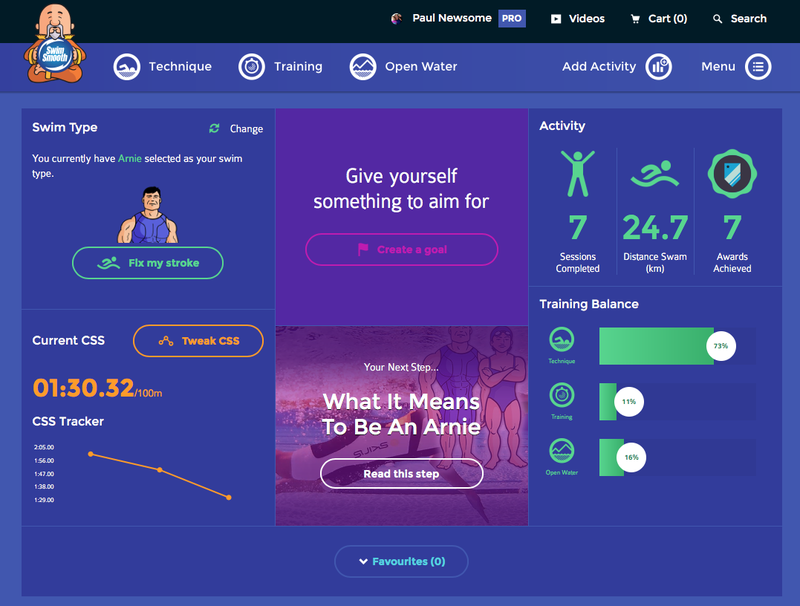 It's simplicity itself and it's included in version 2 of the Swim Smooth Coaching System which we're launching next week (more on that below). Conversely, if you were finding things hard, hit the "Off-Day" or "Bad Patch" buttons - tweaking things to be slightly slower for the next swim. 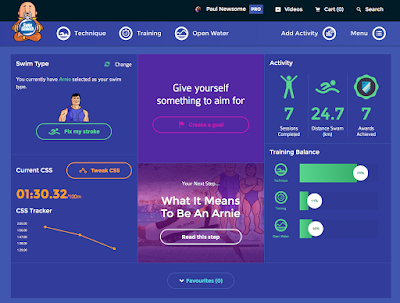 With a little bit of Swim Smooth magic the tweaking algorithm adjusts your pace week by week and session by session to make sure you are always swimming the right speed for your fitness at that exact point in time - genius! What's more, because the tweaking process anticipates the small fitness gain you get from a good session, you are actively leading your fitness forwards. These fitness improvements are very small session by session but incrementally they add up over many weeks of training to some very significant improvements. The beauty of CSS training is that it gives you maximum fitness gains for minimum fatigue. Plus because you swim fast but the pace is controlled, it allows you to maintain your stroke technique during the session. And now by 'tweaking' you can achieve all this without the potentially confusing results or the interruption to your training of the CSS test. The training effect of CSS tweaking combined with using a Tempo Trainer Pro is way beyond what you can achieve using any other training method or swimming gadget. Even swim watches, which are great for counting lengths and timing swims, only give you feedback. They don't pro-actively lead you forwards. 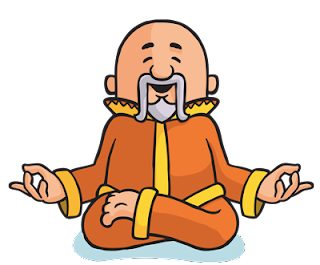 Guru says: Don't fear training - fast it will make you! We can't wait to tell you about all the other new features of V2 on next week's blog! Getting cramp when you swim is not only unpleasant but can be a serious disruption to your training. Worse still, in races it can completely ruin your performance. So what can you do to avoid this annoying problem? 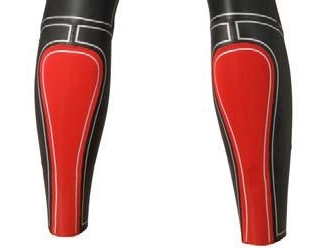 - Swimming in a pool or open water the lower leg gets cooled by the water - this happens even in a wetsuit. - Swimming with good technique with your toes pointed holds the calf muscles in a shortened state. - Swimming a length with the lower leg doing relatively little and then suddenly flexing and pushing off hard from the end of the pool places a great deal of stress on the calf and foot muscles. - Make sure you’re not dehydrated before swimming - a leading cause of cramp. - Drinking coffee before swimming seems to be a factor for many swimmers (over and above the dehydrating effects) - try cutting it out. - Introduce a regular stretching routine on the foot and calves; gently perform these stretches before swimming. Our recommended routine is the เกมยิงปลา HappyFishingSwim Smooth Coach System here. - In races, warm-up properly beforehand if at all possible. Going from cold to full-pace swimming without a warm-up places a lot of stress on the body. - If it’s a major problem for your swimming you could try some regular sports massage on the effected muscles in the build up to a key race - helping to remove any knots and flush out waste products. - Too little potassium, calcium or magnesium in your diet can contribute to cramping. A balanced diet containing these minerals is recommended but you could also experiment with taking a salt tablet a couple of hours before swimming to see if it helps. - Swimming with fins can cause cramp in the foot and calves. Make sure you are using a long flexible fin or avoid longer fin based drill sets. Unfortunately there's no silver-bullet to curing cramp but hopefully the tips above will help alleviate the symptoms. Let us know your own experiences by posting on the blog comments here!